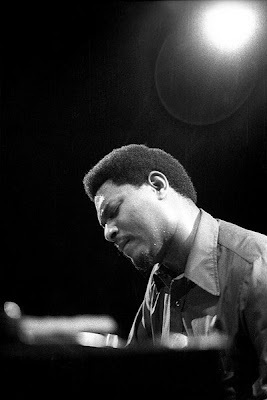 McCoy Tyner has been one of the top pianists in jazz for the past half-century. He was the youngest member of John Coltrane’s classic quartet, and he is still going strong. Tyner’s trio will tour Europe later this month. His most recent album, “Illuminations,” earned him a Grammy Award in 2005. Jazz writer Andrew Gilbert interviewed Mr. Tyner in January 2004 in San Francisco. I am grateful to present that interview here. ANDREW GILBERT: You were born and raised in Philadelphia. How did the city shape you as a musician? McCOY TYNER: It’s a very provincial town, but at the same time it’s a sizable city with a very rich cultural heritage. Historically, George Washington lived there, and the American flag was made there. It was the official end of the Underground Railroad. The Quakers really helped black people escaping from the South and actually hid them under the floor and everywhere else where you could think. They were real Christians. They really believed in what they were doing. The African Methodist Church was set up in Philadelphia. It was a very important place, and it was a wonderful place for people who were disenfranchised to set up something that represented them. I enjoyed growing up there. I think a lot of the guys that I talk to, we all kind of agree, it was just kind of a family oriented town. If you didn’t get your information growing up there, I don’t know how you did... you know what I mean? I really enjoyed it. GILBERT: As a teenager you started hanging out with the Powell brothers, Bud and Richie, which must have been pretty heavy for a young piano player. TYNER: I never actually saw them together. I met Richie when he was with Max Roach and Clifford Brown and they came through Philadelphia. The Powell family was from Willow Grove, Penn., and Richie got an apartment around the corner from my mother’s beauty shop. Sometimes we’d have a small band in there and all of the sudden a bunch of guys would show up and it would become like a big band in her shop, and ladies would be getting their hair done patting their feet. We’d call a jam session and people would come from all over the city. Not just my house, Mickey Roker’s house in South Philly too. Anyway, Richie Powell got an apartment around the corner from me, but I didn’t actually see him once he got the apartment because he was on the road with Max and Brownie. But Bud was staying there for a while until he went to Europe. My mother’s shop had those big windows, and once I was practicing and I looked around and Bud was standing outside listening. Oh my God! GILBERT: Were there any veteran players who really helped you break into the scene? TYNER: We had the older guys who would take you under their wings. That’s how I learned. I had a seven-piece R&B band, and we actually won a talent show at the Uptown Theatre. I had just started writing and I wrote some songs that never had an ending. “When am I going to end this thing?” It was a nice band, good guys. Some of the older musicians heard me, and they liked the choice of tunes. That’s when I first started listening to Charlie Parker, Miles Davis, Diz, Monk. At that time Thelonious and Bud were my main influences. GILBERT: Would you say your most important early experience was with trumpeter and bandleader Cal Massey? TYNER: That’s how I met John Coltrane, through Cal. He was a composer and he wrote “Fiesta for Bird” and a lot of other great tunes, and I was in his band for a while. That’s how I actually had a chance to meet Max Roach after Brownie and Richie died. Max came through and needed a piano player but I only worked with him a day. I just got out of high school and I didn’t want to go on the road, not then. Cal was a major guy in Philly. He’d put on these amazing shows. He’d have a singer, a band, a guy riding a tricycle, a tap dancer. You name it, he had it. Coming up he played in circuses for a long time. He brought that experience to the table. He’d been around a lot of the major bebop players. Working with him was nice. Me and Jimmy Garrison and Tootie Heath and a guy named Clarence Sharp – we called him “C Sharp” – were all in Cal’s band. GILBERT: So how did you and Coltrane first meet? TYNER: I knew who John was but I’d never met him. And Cal invited him to one of our matinees. We were finishing up our engagement and the club owner asked John if he could come in and play the next week. He was home on sabbatical. It was during the mid-’50s. He’d been with Miles Davis and he came home to stay with his mom. He went back with Miles later, when Miles had Cannonball Adderley and Bill Evans with him. Anyway, John asked Cal’s rhythm section if we wanted to make the gig with him. “Sure.” Ever since then John was like a big brother to me. I was 17 years old at the time. I’d go sit on his mom’s porch and he was writing “Giant Steps” and all those songs. I wanted to record them, but he said, “Oh you’re too young.” No, he didn’t say that. But he had Tommy Flanagan and he did a great job. So three years later I was in his band. GILBERT: That must have been a long three years. TYNER: Well, I had a commitment. John would come to Philadelphia when he wasn’t working with Miles, and I’d work with him, and there was a verbal agreement that whenever he left Miles I would work with him. It took him so long because every time he’d want to leave, Miles would offer him more money or something to make him stay. I was stuck in Philadelphia, and when Benny Golson came through he liked my music. He said, “Look, I’m going to San Francisco, you want to come out there?” I had never been that far away from home. I was in my late teens. He said, “Art Farmer and I are going to form a band, would you like to be in the band?” I said I would, but when John leaves Miles, I’ve gotta go. I told them up front. That’s when we did “Killer Joe,” which was a big hit for the band. I was with them about seven months, and then John left Miles and he said, “What do you want to do?” I was 20 years old and I had to make all these major decisions. But I did promise him and I wanted to be with him. That’s the band I wanted to be in. After that it was just… making history. GILBERT: The classic quartet with you and Jimmy Garrison and Elvin Jones didn’t take shape immediately though. TYNER: Right, it took a while to come up with that personnel. Elvin came in first, then Jimmy came in. John envisioned this. I had heard of Elvin, but I had never sat down and listened to him. I knew his brothers Hank and I had heard Thad, but John told me this guy Elvin Jones is really amazing. We had a lot of trouble coming up with drummers before. Pete La Roca was in the band, Billy Higgins was with us for a while, a couple of other guys. Elvin came in the band and we knew that was it. On bass, my brother-in-law Steve Davis was the first and he did “My Favorite Things,” then Reggie Workman and then Jimmy, and that was the magic combination – Jimmy and Elvin. I was the young kid on the block. (laughs) Like at the end of sets, Elvin and Jimmy would have a little taste, and Elvin would look at me to see what I had and I’d say, “Give me a double orange juice!” (laughs) He’d watch me like a hawk. There was a very brotherly feeling in that band. I love McCoy Tyner and have seen him many times. A colleague of his with Coltrane, the bassist Art Davis, died yesterday. His obituary mentioned that he tried out for his hometown symphony orchestra at 17 and was rejected for being "colored." He was later blacklisted in the 70s for speaking out against racism in the music industry. A really great player who deserved to be better known. I can't wait for my chance to see McCoy Tyner live.